Every time I open app.wire.com in Firefox I see Google geolocation API requests being made with my exact (!) location (Latitude/Longitude) to determine my location (displayed in Settings). JSON response from Google contains my exact address. Since I don't remember that I was giving app.wire.com right to determine my location via browser Geolocation API there is only one source of such information - only my IP address. I believe this is serious flaw for security oriented messenger. Google is the last thing I want to see in Wire network communications. P.S. Just double-checked via TOR. Yep, IP is the source for latitude/longitude and THERE IS NO WARNING about geolocation requests. Furthermore, the https://web.localytics.com/v3/localytics.min.js is requested too. As a rule of thumb, only https://*.wire.com must be accessed. Localytics is requested before login only, I believe, to collect usage data. I see no big flaw here. But geolocation (via IP) without notifications (on server side I believe) is very bad idea. I seems like Wire's server side has got email — IP (and latitude/longitude most likely) pairs in open form. i agree with you that wire shouldn't have traffic with 3rd party hosts. Localytics is the telemetry service wire uses. It can be disabled in the options of the client. Then it should be gone (theoretically, haven't tested). I already pointed out elsewhere that it is a bad idea to have Localytics enabled by default, and not as an opt-in option. 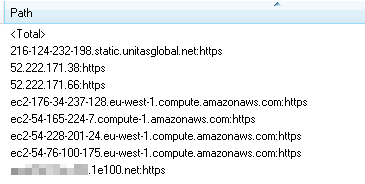 and the other called host, googleapi... could it be browser-dependent and not wire-dependent? It is universally used by Chrome and Firefox. Statistic via Localytics has got nothing todo with crash reports (which can be opted in Settings). I can confirm the geolocation requests on firefox. 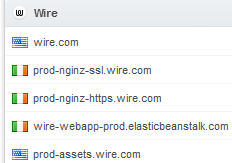 But I guess the source-request is not coming from wire directly (maybe localytics or something else). Would be nice to find out where it comes from. As far as I know, on the Desktop-Client, you can opt-out of localytics, which means no "usage- AND error-reports" (on desktop-wire there is only one option for both). I read somewhere that, on the wire-Webapp you can't opt-out of this. So that could be the reaon. thx, doesn't matter, just the proxy-isp geo info. don't have much time now, but I will try to wireshark desktop traffic to see if it's the same then. yeh everybody can have some fun with my proxyisp geolocation. every website I visit got this information too, so I don't consider this as secret. JS function in wire-app.min.js does that request. I didn't dig further (morning is coming for me and I didn't get a wink of sleep) but I believe this information is used in Settings to show login location for current device. I'm more concerned about server-side activity since they clearly (correct me) store that information in unencrypted/unhashed form. • Timestamp: The UTC timestamp when the client was registered. • Location: The geo-location of the IP address used to register the client. As I already said it is mentioned in whitepaper but still looks like serious flaw to me. Sorry, I'm at work, dig a bit later but how do I get my location in settings? Obviously they make some sort of geoloc. request. Maybe just on server side but it doesn't diminish this fault. This is the Desktop Wire-Client starting with an already logged-in account. Thats the Desktop Wire-Client starting and logging in with some already registered user-account. I didn't test a new account registration with the desktop client. so it could be, as mentioned in the whitepaper, that on registration geolocation information will be requestest and therefor googleapis might show up in the logs. But so far, if used with registered accounts, no geolocation requests show up when using Desktop Clients (at least client-wise). ОК, it's clear but web-version sends those requests to Google every time I open it. Let's wait for developers to comment. It's obviously Localytics which can't be disabled in Wire's Browser-version. I assume it collects geolocation information (by resolving IP geo-data via google) to be sent with usagedata and/or errorreports. I guess if this telemetry thing would be opt-in instead of opt-out, it wouldn't show up. what options do we have if thats the case? opt-out of telemetry by default? change Localytics internals to not resolve geolocation information? Localytics si blocked on my side and the GMap URL still contain the geolocatisation. As described in the whitepapers, Wire shows the location of where clients were registered. The sole purpose of that location is to assist users in identifying suspicious clients registered with their account, e.g. as a result of account compromise.